OK - Ping Pong Party People, for those of you who already have one of the best table tennis tables and want to hone your skills, a really good investment is a ping pong robot machine that can be programmed to fire a basket of table tennis balls at you. They are one of the best accessories you can buy for practicing. These robots will ultimately help you practice, shape, improve your killer strokes, shot, footwork and generally learn to out-smart your competition. If you want to practice on your own for hours on end and improve your game then these Ping Pong robot machines are for you. 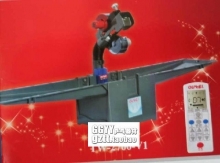 Due to popular global demand there has been a huge growth in the marketplace with Table Tennis Robot machines, because people realize how much fun it is to play table tennis, raise standards in the game and it's not always the case that you will have a partner to play with when you want to play. A table tennis or ping pong robot can be your best training buddy that never gets tired. So these neat machines solve a problem and give you the ability to practice, improve and become a more all-round competitive player. Due to popular demand businesses have responded to the market and realized the need for these machines and they now have a wide selection on the market to choose from. So here at Best Table Tennis Tables we have hand picked a few table tennis robot machines to review, providing a selection of the Ping Pong robot machines that are on the market for families and re-creational players. We aim to give you advice and guidance in choosing the right machine for you. It can get quite confusing as there are so many different machines. The robots range from beginner, to intermediate and then advanced. In general the more expensive machines have more features and are meant for the pro players. The Newgy Robo-Pong 2040+ is an upgrade on The Newgy Robo-Pong 2040. This year, Newgy have brought to market a more extensive range of robots, due to demand, catering for different player skill set and affordability. The Newgy Ping-Pong 2040+ is a great robot that will give you an all-round practice and slight more advanced than the other models in the Robo-Pong 1-50+ and Robo-Pong 1040+ due to the controller it has attached to the robot. The controller allows you to have flexibility over spin, speed oscillation and trajectory (how fast the balls fly at you when you’re playing with the robot). The Newgy Robo-Pong 2040+ gives you a good sense of a real world player, but in my opinion better, as it’s more consistent than a real player. The controller is conveniently on the player's side of the table, so you have good control over the ball speed, placement and Oscillation. The 2040 Plus, comes with a recycling net system to capture your returns and allows for continuous play. The Robot has near real-world player experience in that it can deliver you a range of shots, including push, chop, serve, lob and fast loop. Personally, if you want to practice particular shots, the robots gives excellent repetition and will improve your game no end. With no assembly required it’s easy to set-up and put away when you have finished the game. The Oukei TW-2700 08B Professional is a fantastic robot all the way from China. At first look, this looks like an incredibly complicated bit of kit. What you get is loads of functionality and an excellent Ping-Pong robot to improve your strokes and movement in a game of table tennis. The Oukei TW 2700 08B, is very advanced and can be set in programmed, to adjust the spin, speed, variation of the ball. The Ping-Pong Robot has two main modes, program mode with preset exercises and mixed random mode, to improve your movement and reactions. Both these modes help with repetition to improve your forehand and backhand strokes. The robot comes with a recycling net, a very sturdy frame and bucket, holding up to 40 balls, to provide a continuous workout. The Oukei TW 2700 08B is an excellent value for money and can be used for beginners and advanced players, who want to step up their game. The Newgy Robo-Pong 2050+ is the upgraded version of the Newgy Robo-Pong 2050. The key differences between this and the Robo-Pong 2040, is that this Robo-Pong 2050 Plus model is digital. This means it comes with 64 practice drills, which are pre-programmed so you can play on your own from the preset menu that this robot has to offer. The Robo-Pong 2050+ can handle up to 40 balls in the recycling system, it comes with a net, so the balls, are fed into the recycling system, which allows for continuous play. This will massively improve your consistency in the game and provide repetition in your strokes, so you can improve your skills. With digital programming you will be able to control the speed, placement and frequency of the ball. The controls allow for random selection, which will keep you on your toes guessing where the ball is going to come next. A very neat feature is that you can control the topspin, backspin, side spin and have a combination of spins to be served at you, making this a near real player experience. The Newgy Robo-Pong 2050+ is very easy to set up and store away after the game and comes in 6 different languages. The digital controls make it very accurate for ball placement and gives you an overall great practice to improve your game. Controller is a bit old school. The Butterfly Amicus Basic, is as the name suggests, the most basic Robot of the three, but still comes packed with features to use as if you’re playing against a real player. The Amicus Basic will throw you up to 100 Balls per minute and you can adjust the length of the Robot. The Analogue controls can be placed at the player's end of the table, making it easy to control the robot. You have full control over the spin, speed placement of the ball and the way the ball is thrown from the robot. This gives it a near player experience, allowing for different spins, like side spin, backspin and topspin. The Amicus Basic Robot comes complete with a ‘recycling net’ to catch the balls when you have returned the ball for continuous play and is excellent for a beginner or slightly more advanced players who want to practice repetition and or play on your own. Oukei Tw2700 V1 ping-pong robot is a portable and robot for players that need to carry the robot around to different venues to practise their game. Or if you are playing alone at home in a garage then they have made it easy to store away and transport as it comes with a bag. Oukei are known to produce really high quality robots and this is a very good basic robot at fair price of $699.00. They have provided a table tennis robot with pre-set exercise programmes with three different programme modes. Programme mode, Random mode and regular mode. These options give you a fair bit of flexibility for variation on ball throwing options. The Oukei TW2700 V1 Professional ping-pong robot has three spin options and five landing spots on the table. You can only programme this robot for topspin and backspin, they don’t have the option for side spin. It does come with a really nice remote control, net catcher, ball pick up net and has a serve trajectory of 100 balls per minute. Not bad for the price and we think it's a great option to go for against other priced table tennis robots in the range. Killerspin have definitely provided a table tennis robot with a difference. It looks stylist and compact, easy to use and transport around. For thoses of you who want to play in church halls, community centres or at home in the garage then this robot is for you. It's aimed at the mid-priced market give a lot of features for the money. It’s a single head robot, that provides good speed, spin and serving options with up to 100 balls per minute that can be thrown. Killerspin have made the whole solution easy to set up and put away. It comes with a bundle, a ball net catcher which sits neatly on the edge of the table to allow for the re-cycling system to work. You can programme this robot by a wireless remote control system which gives you different options to practise your stokes. This will give you a very good work out as the balls can be programmed fly out at 99 mile per hour. If you have the programme on random mode and interchangeable spin, this should improve your reaction times. For the price at $1,022.18 it's definetly good value for money and stacks up against the competitors in the price bracket. Paddle Palace is a family table tennis business from Portland, Oregon who have a long history in the game. They have around four top quality ping-pong robots in there range for the keen leisure and club level players in the market. Paddle Palace have produced the S4W Pro table tennis robot which has an interesting twin head robot. This allows for each head to be customised and give you a different throw on each head. This makes for great exercise workouts, so you can practise footwork and different strokes. It comes with a digital controller which is customisable for different spins, speeds and oscillation. The controller has 30 pre-programmed exercises and you can even customise the exercise programmes to your requirements. The robot is a very well built solid machine, that I think will last you for a long time to come. Players at all levels can enjoy the S4W Pro table tennis robot as you start to develop your game. It comes with 120 table tennis balls, a ball collection net and a 1 Year warranty. At first glance it looks a bit 70’s but with no setup required, just plug it in and programme the robot, it’s easy to see why many clubs and homes have gone for this fantastic table tennis robot. It comes with a price tag of $1,499.95 which is slightly more than other robots in the range, but you get a lot for your money. It's packet with features that will build up that sweat and beating your friends in no time at all. If you're anything like me and have a compeititive streak The Paddle Palace S4W PRO Table Tennis Robot is definetly worth a shot. The Paddle Palace H2W robot is the top machine in the Paddle Palace range. This USA based company have been producing high quality table tennis machines for a number of years and the H2W is one of the reasons that they have such a great reputation in the industry. This is an incredibly versatile robot and not one we recommend for beginners. It has a lot of programmable serves along with 22 table placements for each serve. The serving sequences you can produce with this machine can be incredible complex and you can store your own customizations in the memory for instant recall next time you play. If you are an intermediate to advanced player and regularly find yourself without a partner to practice your shots and returns with then the H2W will not let you down. You would never need to buy another robot. As a one-off purchase, it actually makes the expensive H2W look like good value as you will get years of use out of it. This is the most popular pro-level robot on our site and the customer reviews reflect it's high quality and versatility. So, if you are looking for the best, then look no further than the USA Paddle Palace Brand, with this their top-of-the-range model. Newgy Robo-Pong is an American brand that produces a robust table tennis robot for the home and leisure market. Very similar to the Newgy Robo Pong 2050, it is a solid Ping Pong Robot that comes with a single head, recycling net for continuous play and an analogue remote control. It’s a perfect ping-pong robot for families that want to improve their strokes and foot-work exercises. Become a better player against your friends! The ball net catcher works by re-cycling the balls into the robot. The single adjustable head allows you to place serves. The analogue controls allow you to set the Speed, Frequency and Oscillation of the ball. The spin options can be programed to side-spin, top-spin, back-spin and even different combinations of spins. It’s very well priced at $581.39 which is excellent value if you don’t want to spend too much on a table tennis robot and need an entry-level model. It comes with 8 different oscillation options, 48 table tennis training balls and a training DVD so you can learn how to use the robot. This is the top of the range model for the iPong table tennis robot series. The iPong has been branded very well and it is great to have around if you want to practice in the office or at home. For those times when you want to play on your own and not take up much space with equipment the iPong v300 is perfect. It is a very compact, lightweight robot which has a two-wheel design giving you a great ball throw considering the size of the machine. It’s has a wireless remote control with four settings giving you the ability to control the speed, frequency and placement of the ball and spin. It can produce backspin, sidespin and topspin serving balls, so you can practise your forehand and backhand shots. That will make for an impressive improvement when you’re next up to play with your friends. It’s very quick to set up and you can start playing in a matter of 5 mins. Priced at $148.99 this makes for a very cheap practice partner when you want to get a competitive advantage over your friends and family, or just want to improve your game. Designed specifically for the home and leisure market for players that want to have fun with their family or if you have children who really want to learn how to play. This ping pong robot is for you. This is Newgy’s top of the range ping-pong robot and it’s similar to other single head ping-pong robots on the market. It comes with a ball catcher net, robot and remote control. The Newgy Robo-Pong 2050 is a digital ping pong robot which will give you good control over the speed, trajectory and placement of the ball. It comes with three different programme modes, which include Drill mode, Random mode and normal mode. Drill mode has 64 customised exercises workouts. Which will help develop your strokes, leg work and combination of skills to step up your game. This is Newgy’s top of the range table tennis robot. Which comes with a ball catcher net which sits on the edge of the table, digital controller and 12 table tennis balls to kick-start your robot experience. Priced fairly at $749.00 compared with other more highly programmable robots. The Newgy Robo Pong 540 is the most basic ping-pong robot in the Newgy Robo Pong range of robots. It is really designed for families, children or players that are just getting started in the game and really want to develop their basic shots.It is a compact neat little table tennis robot that sits on top of the table, it has a bucket for balls, a ball funnel thrower to feed the ping-pong balls to the robot head. It comes with an analogue controller allowing you to control the speed and frequency of the ball and can throw up to 60 balls per minute. You will need rotate the robot head to produce different spins like topspin, sidespin, backspin and it can do a combination of spins to be thrown at you. This will help develop your stokes to a basic level and help you learn how to handle returning different spins. It comes with a price tag of $279.00 which is very good value for someone who is just starting out in the game, Whist it is very basic and has no pre-programmed exercises like the other Newgy Robo Pong Robots in the range, it's not bad basic robot to start out with. The Newgy Robo Pong 1040 table tennis robot is a step up from the Robo Pong 540 and has a few more added features and functionality to develop your game, if you're ready to take on the challenge. It's similar in that the robot sits on top of the table and is an all in one solution. It has a larger bucket which holds up to 200 balls and comes with a slightly more advanced analogue remote controller. The remote controller comes with the ability to adjust the speed, frequency, and oscillation of the ball. To change the spin of the ball you need to turn the head of the robot round and you will need to move the robot around the table to get it to throw different angles. It can produce, topspin, backspin, side spin and even a combination of spins. Couple these spins up with the oscillator speed, you're in for a little fun. Priced at $349.00 it's a fair price compared to other table tennis robot's in its range. It's a solid machine and should last you long enough until you're ready to get a more advanced table tennis robot to develop your game. Table Tennis Robots are an awesome way of practising returning a ball! I love these table tennis robots! Why Do You Need The Newgy Robo-Pong 540 Robot Machine? What’s HOT About The Newgy Robo-Pong 1040 Table Tennis Robot? Why Is The iPong V300 Table Tennis Training Robot A Must Have? How Good Is The Newgy Robo-Pong 2040 Ping-Pong Robot?